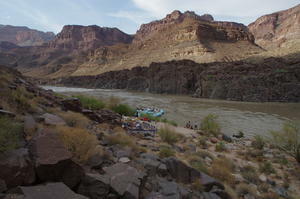 Also, here's a Google Map of the river portion of our trip. 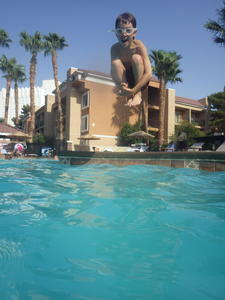 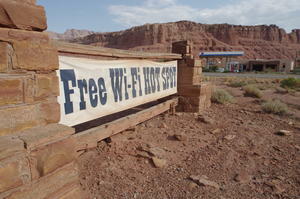 Fortunately, we were only in Vegas a day and half before the trip. 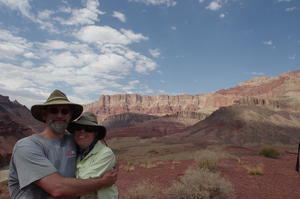 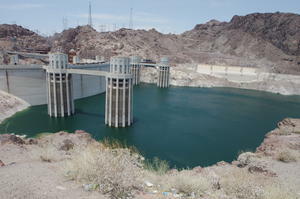 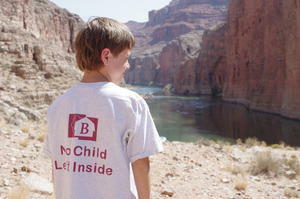 As part of the experience, David Z. arranged a tour of the Hoover dam on the 5th. 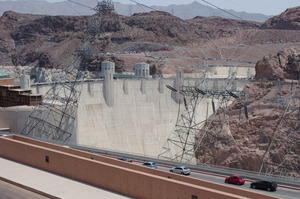 David W. declined the claustrophobia inducing tour of the turbines and instead ventured across the dam to take a photo. 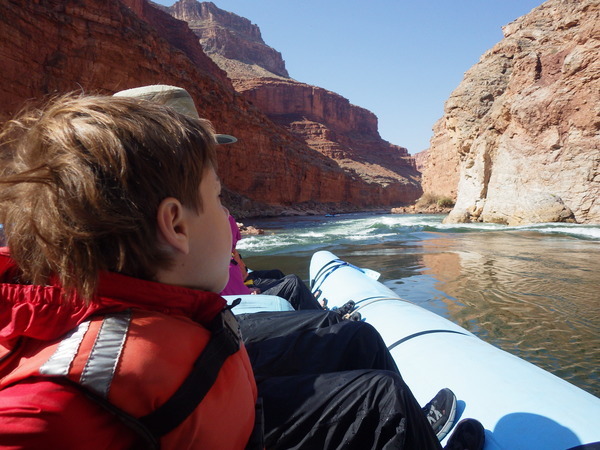 Of course he was on the lookout for house boats having read The Monkey Wrench Gang. 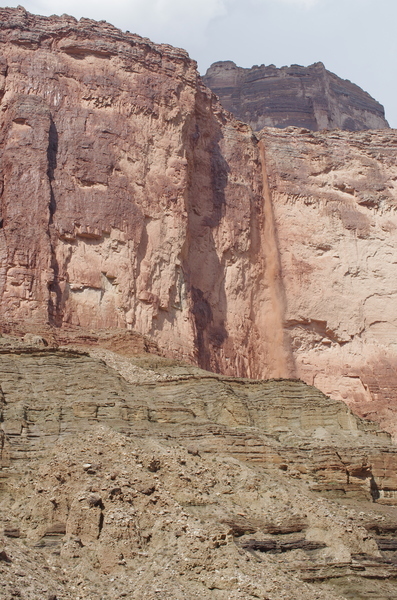 It's a hugely impressive structure. 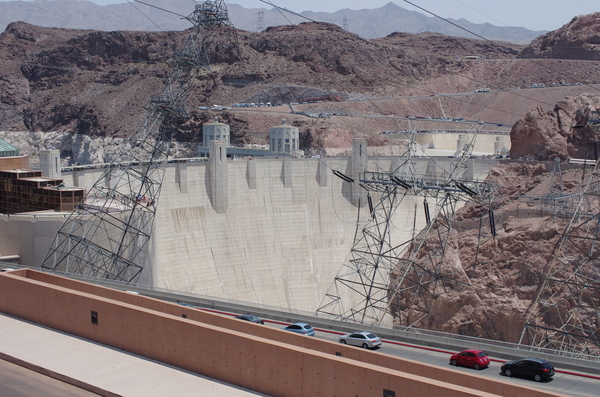 All the more so when you hear about the fact that it was completed ahead of schedule (which seems rare for government projects these days). After a hot mornings tour, we spend some quality time in the pool. 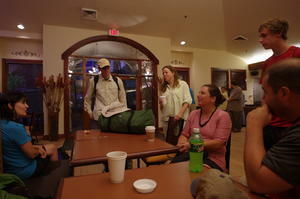 The next morning, we gathered early in the hotel lobby (the Desert Rose treated us very well as a basecamp for the trip) for the bus trip to the airport. 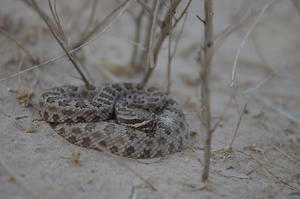 There were some blury but exicited eyes at 5am (and coffee to go around). 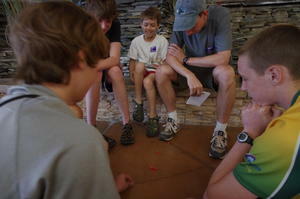 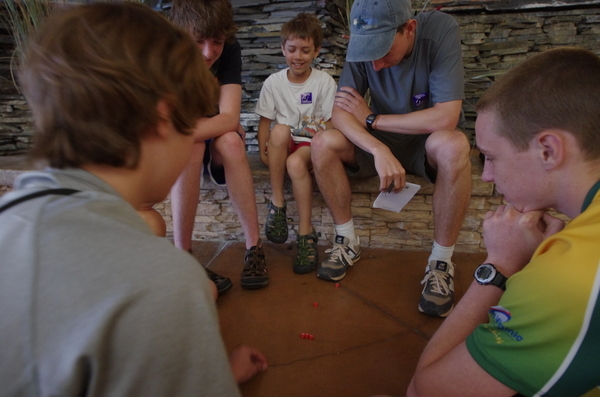 At the airport, those in-the-know introduced those not in-the-know to "Farkel," a dice came which turned into all the rage (but was hard to play on the sand). 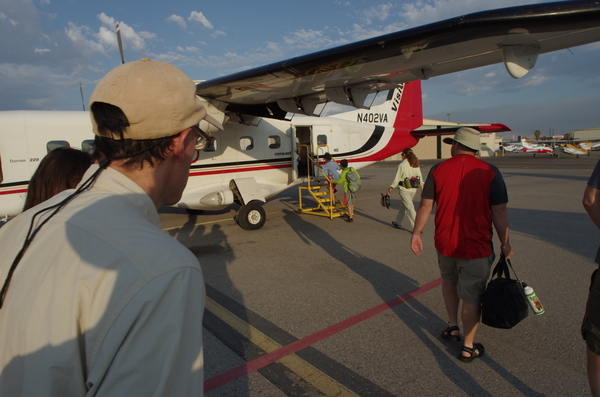 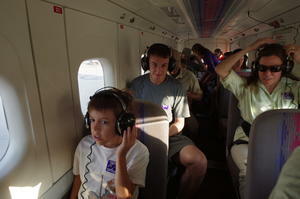 The planes were small (our group required two planes) and the plane ride quick and uneventful. But clearly the adventure had begun. 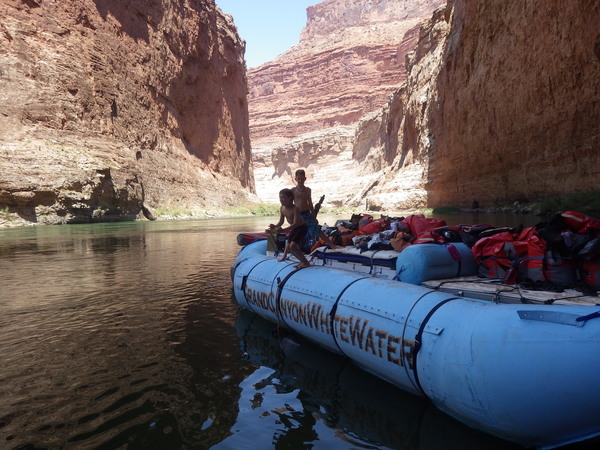 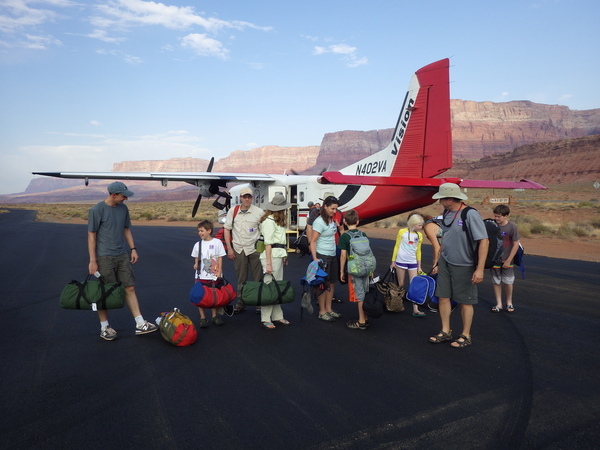 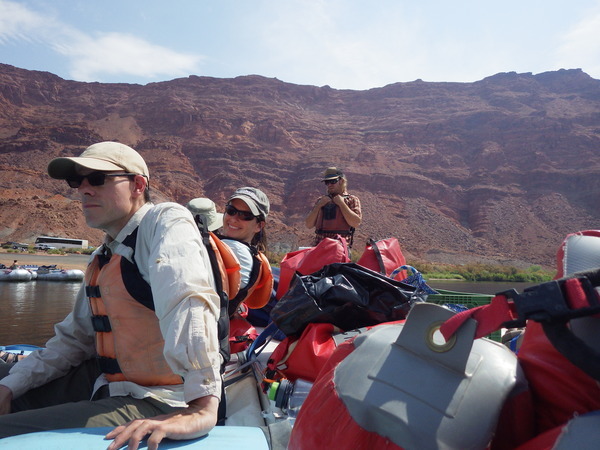 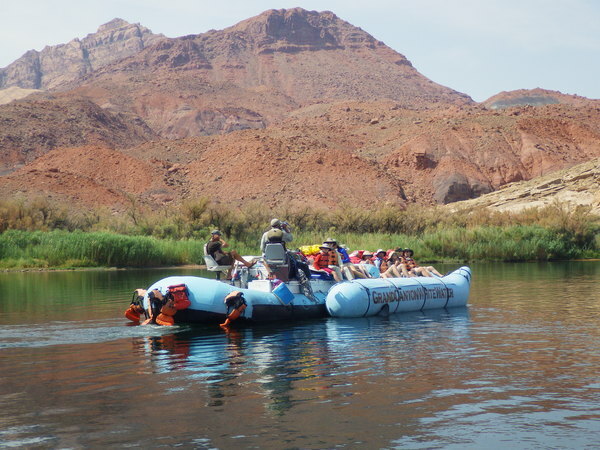 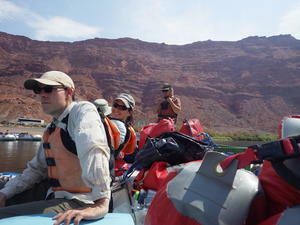 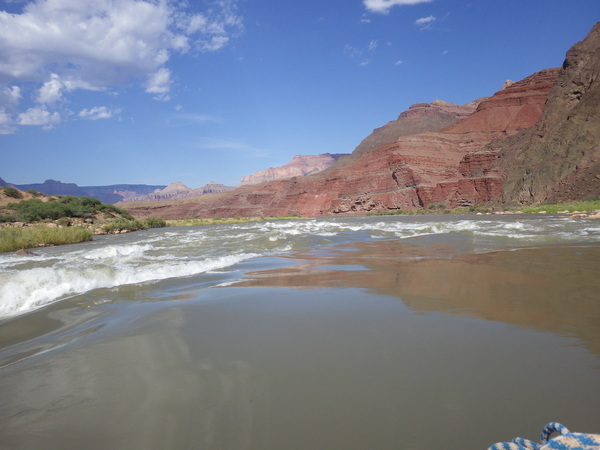 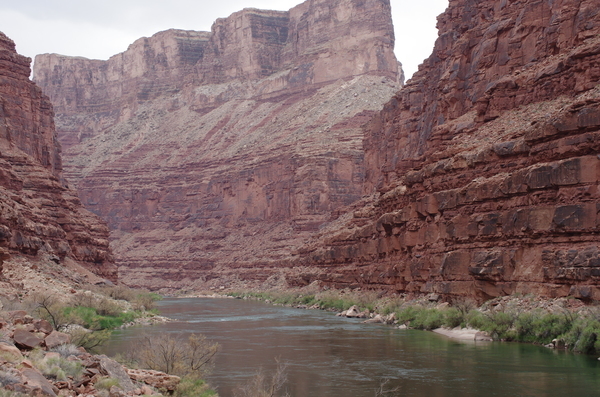 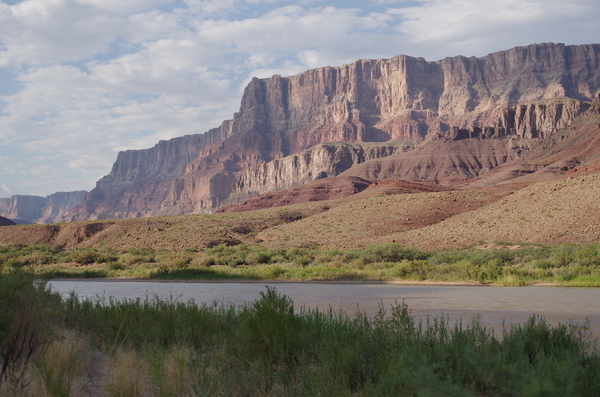 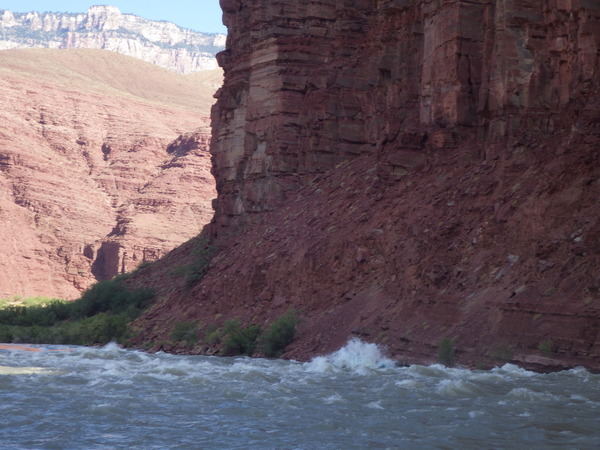 When we landed at Marble Canyon, we met the remaining members of the crew for the short van ride to Lee's Ferry and the waiting rafts. 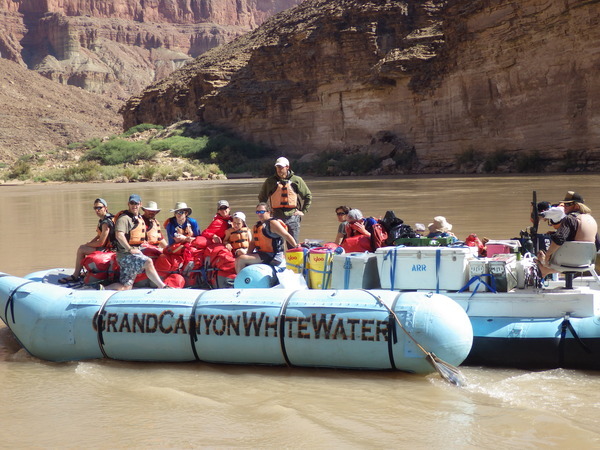 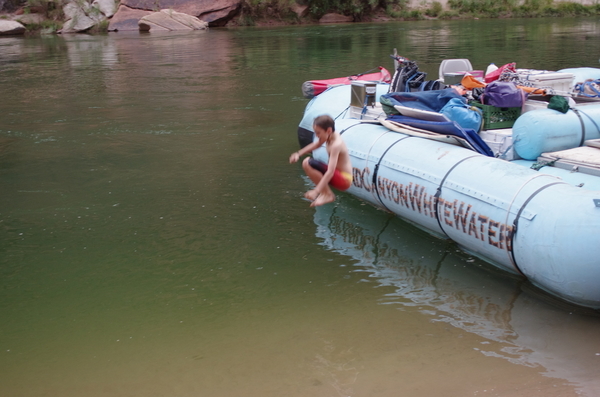 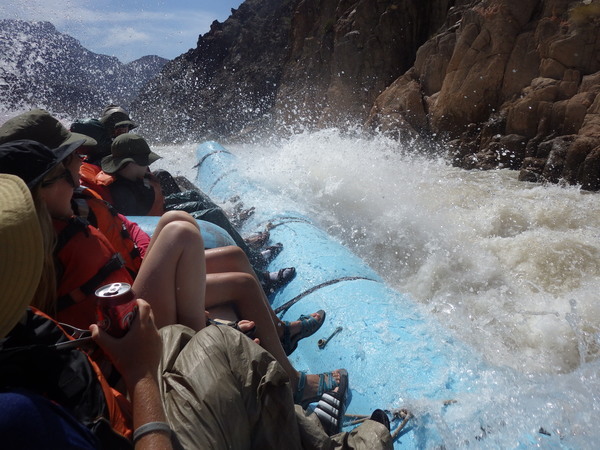 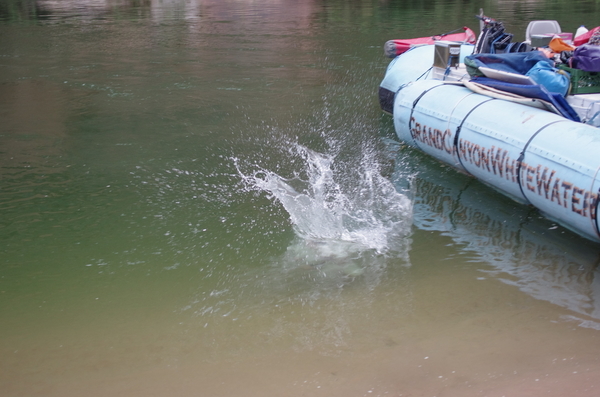 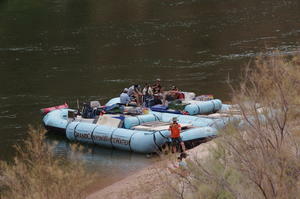 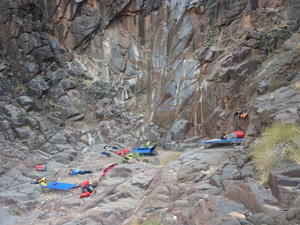 Our group of 27 customers and 4 guides easily fit on 2 motor rig rafts. 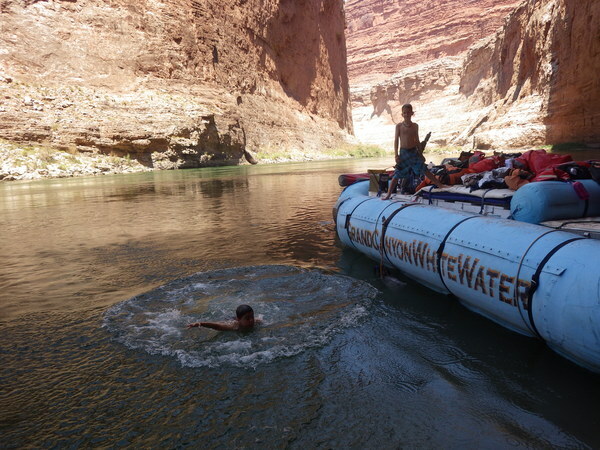 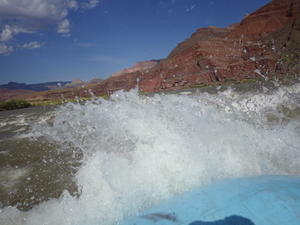 And we all learned in the first few rapids that the Colorado, coming out of the bottom of the Glenn Canyon dam, is pretty cold water. 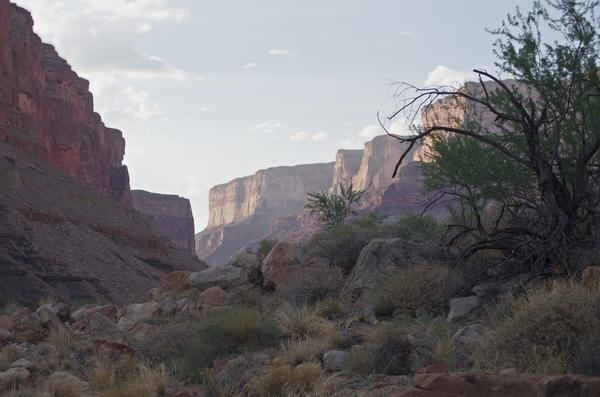 Our first campsite was beautiful (as they all turned out to be). 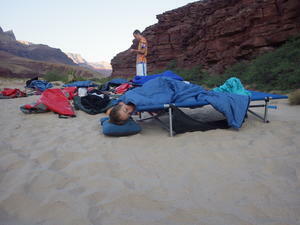 And we got the hang of the bag line and setting up our cots pretty quickly. 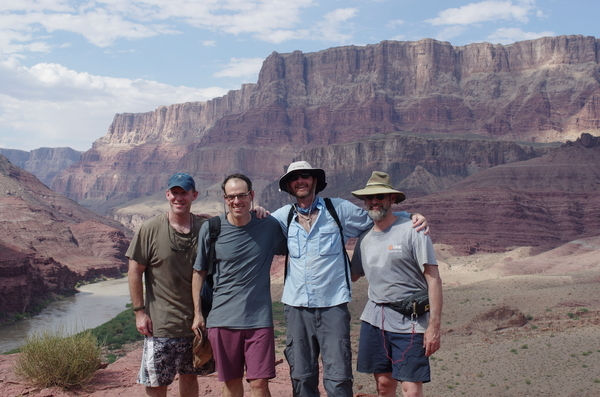 The guides: Matt, Easy, John and Ed (who goes by Special) did a fine job taking care of us, pointing us in the right direction and providing great river food througout the trip. 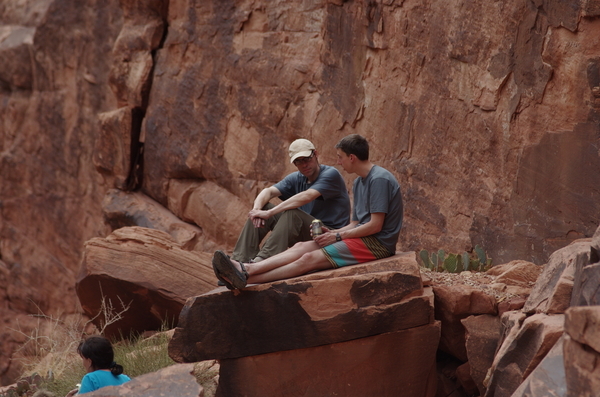 There was lots of time to relax and explore on our own. 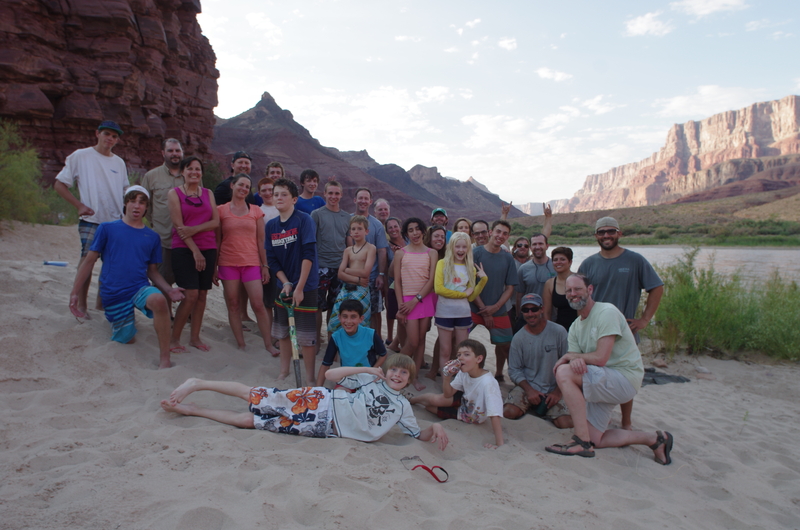 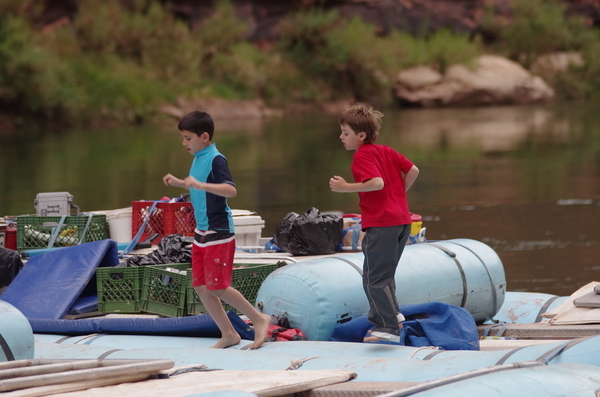 The kids got along really well; all the extended family and the kids from outside our tribe joined into one new river-family. Robert may have been the youngest but not by too much. Sammy was his usual adventous self; happy to take the first plunge into the chilly water. We finished off our first day on the river with a great treat: Val Galagher on guitar under the stars. 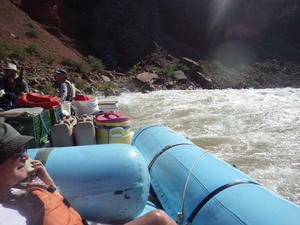 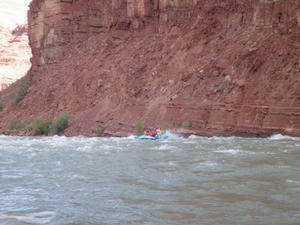 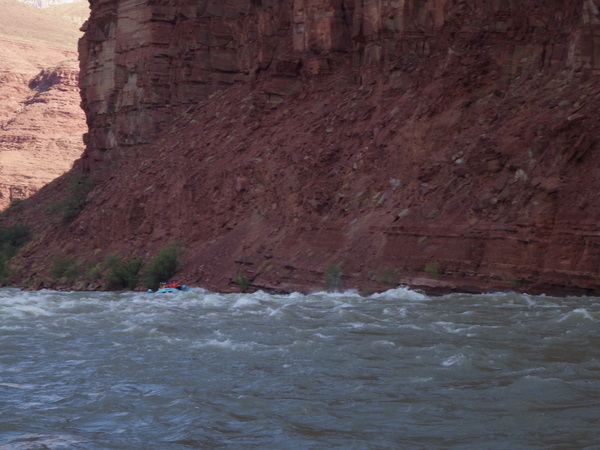 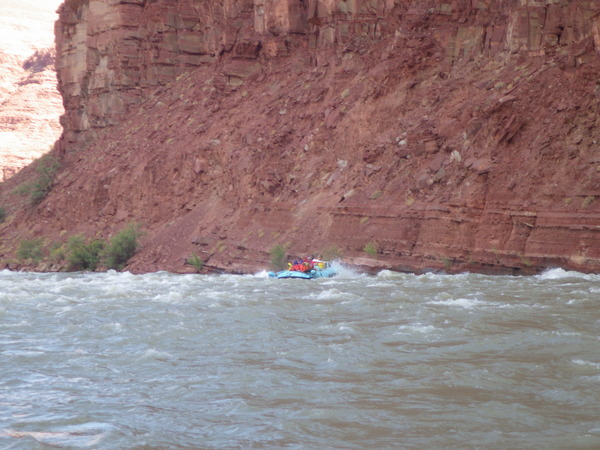 Our second day on the river, we loaded up the rafts and headed downstream. 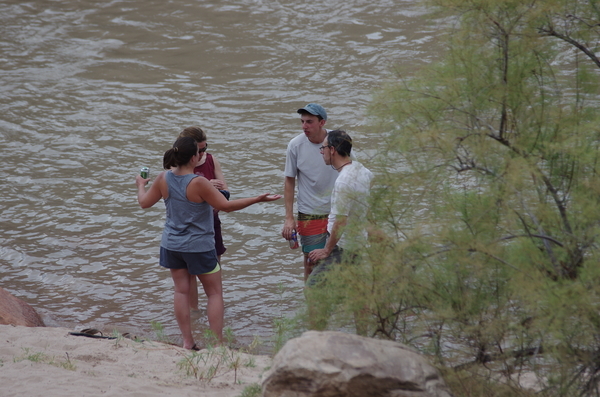 Matt (the trip leader), gave us the plan for the day, "Head... that way," pointing down river. Below left: John, with his hand on the throttle, was the guide/motorman on the second raft with Ed as his ever helpful assistant. 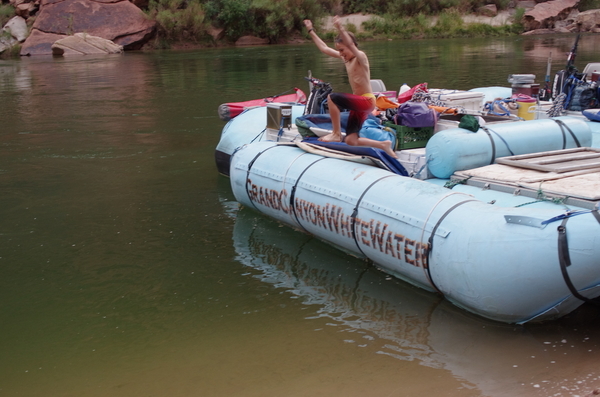 We'll see Matt and Easy from the first raft later. 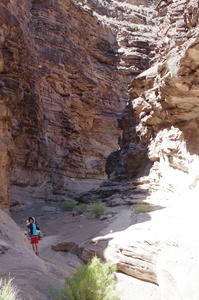 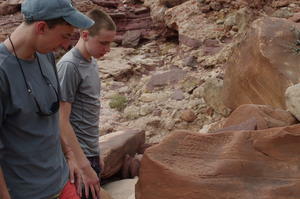 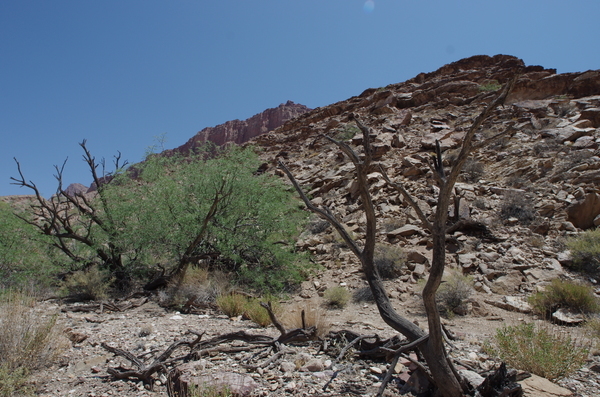 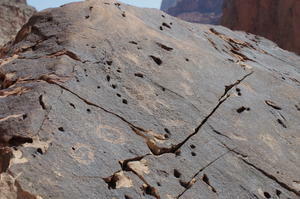 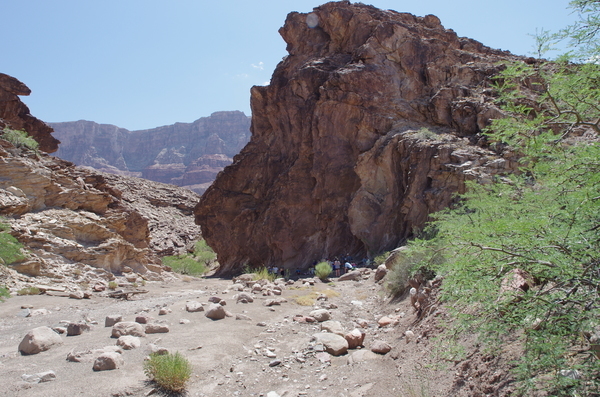 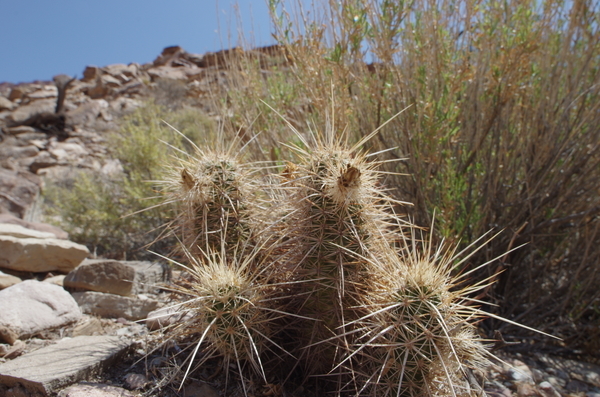 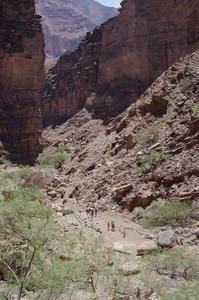 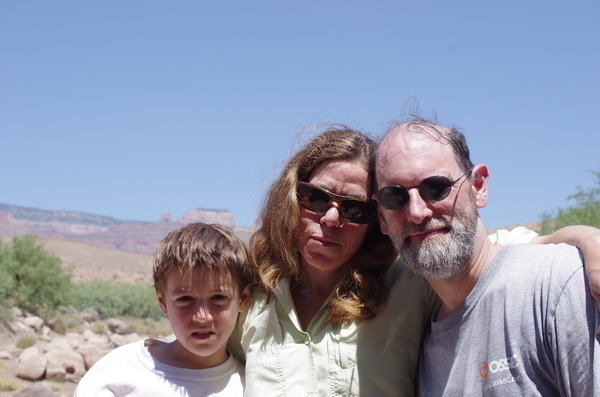 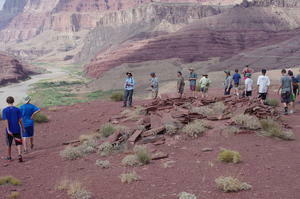 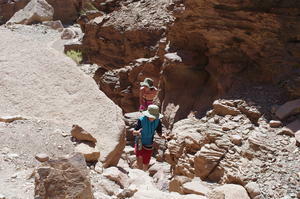 Below right: a hike up to see some petroglyphs. 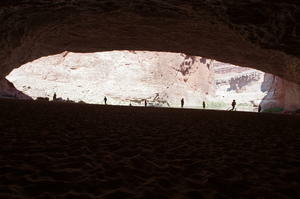 Day two was also our Redwall Cavern day. 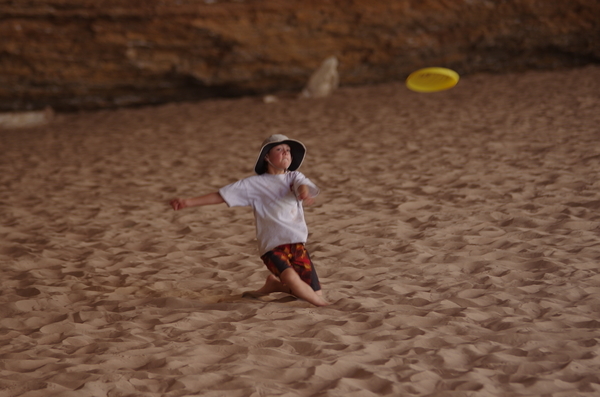 Of course, the frisbee came out. We even had time to hang around and have lunch on the beach in front of the cave. Robert joined in to take the plunge at the cave mouth (as did Maya). 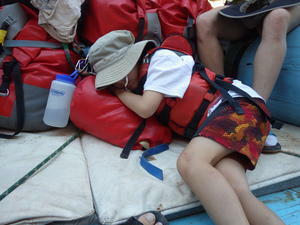 Of course, our day was not spent on the ground, there were river miles to make and rapids to run. 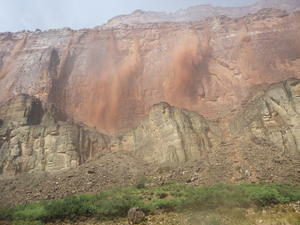 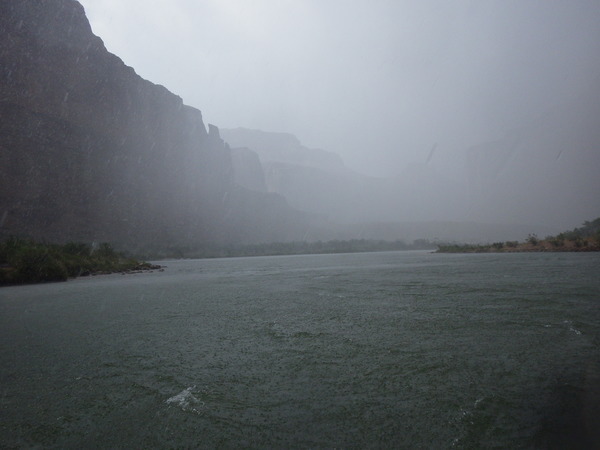 The payoff from the monsoon was one of the most spectacular sights on the trip. 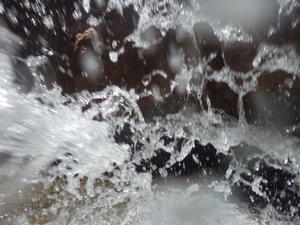 The muddy waterfalls from all the rain pouring silt into the river. 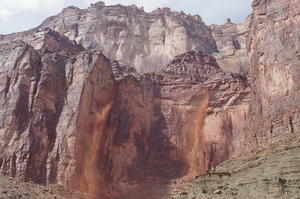 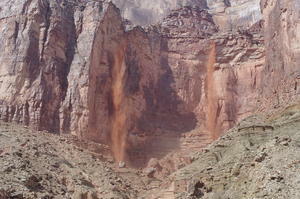 Matt called the effect the Canyon veils. 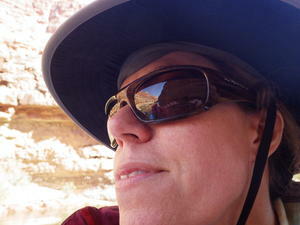 With the wind still blowing, but not nearly so hard, the "veils" really seemed apt. 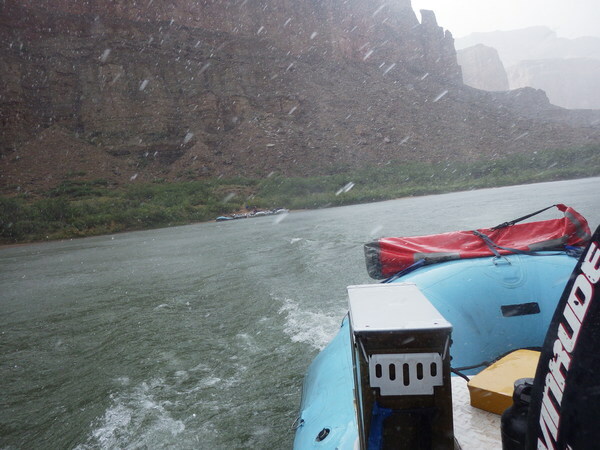 That 15 minutes of intense rain really seemed to last a lot longer. The sun felt great (at least for a while) when it popped back out and we headed downstream, "That way," to our campsite. River day three started off with breakfast, breaking camp and packing up the rafts. 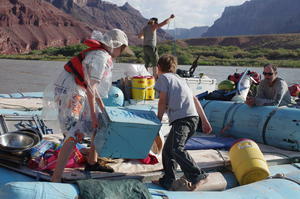 Raft packing involved several lines: the bag line (getting the dry bags onto the raft), the cot line and chair line followed suit. 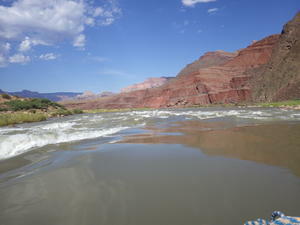 Note the change in river color after the storm. 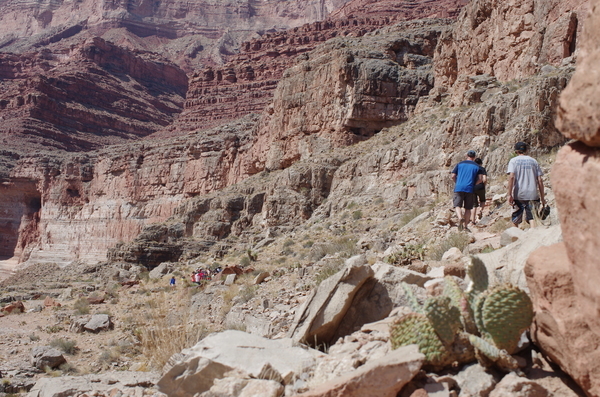 This was chance to see much more around us and feel like we could see out of the Canyon. 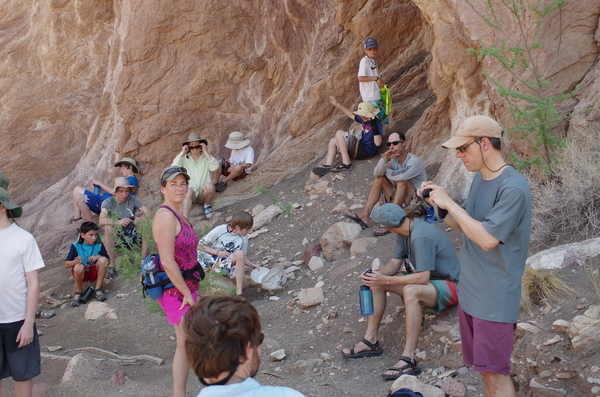 There was also some welcome shade under the cliff face. 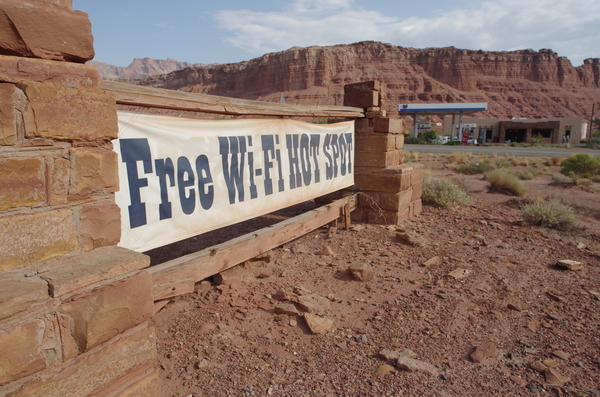 And a scenic spot for a photo of the hot travellers (thanks Ian). 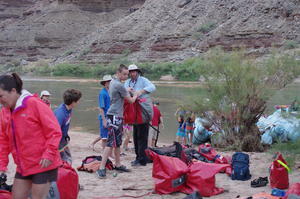 We headed back down to the river, the rafts and lunch. 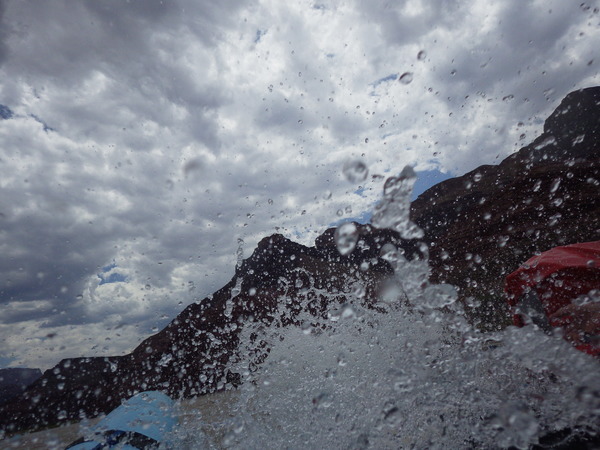 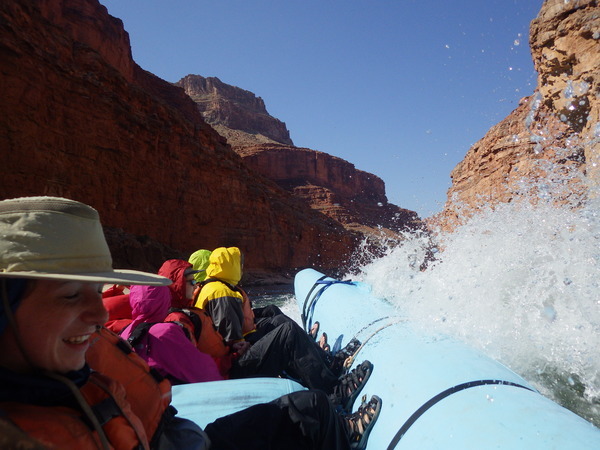 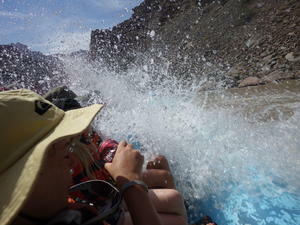 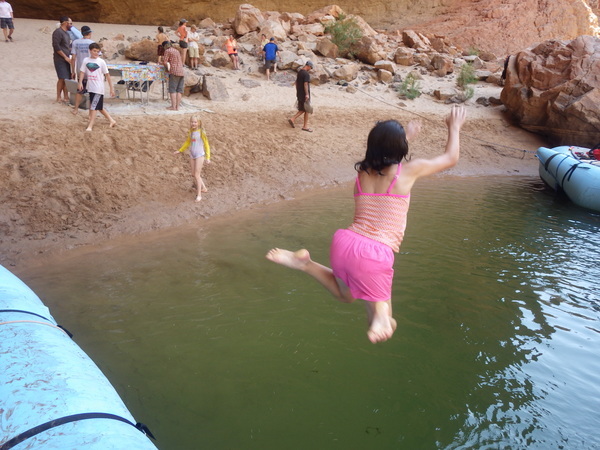 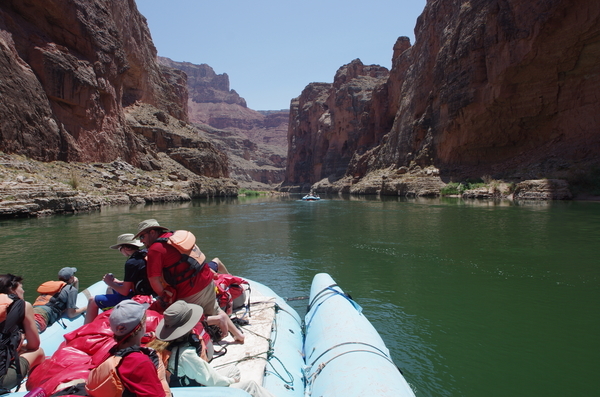 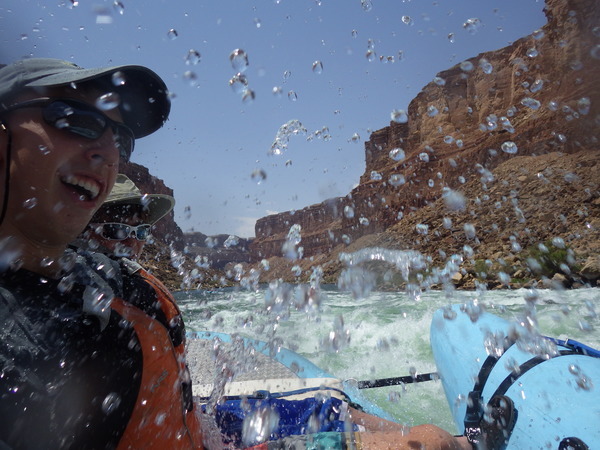 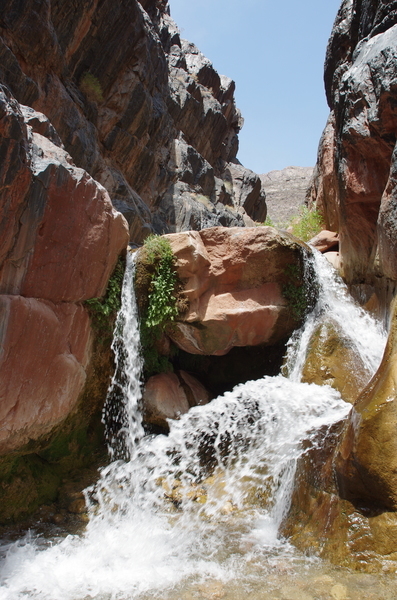 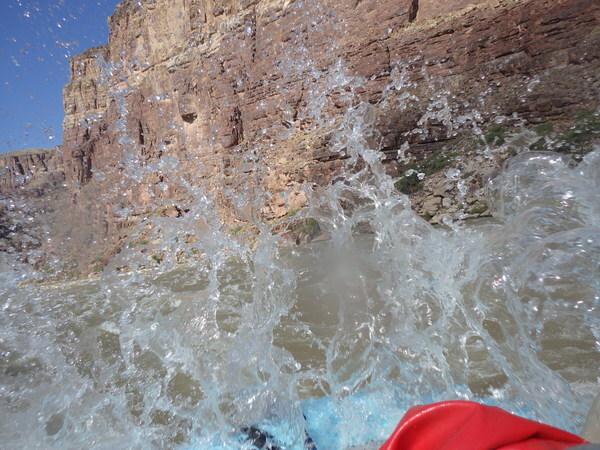 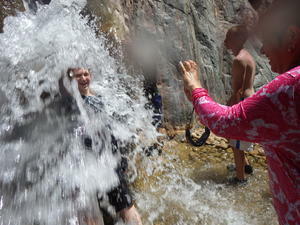 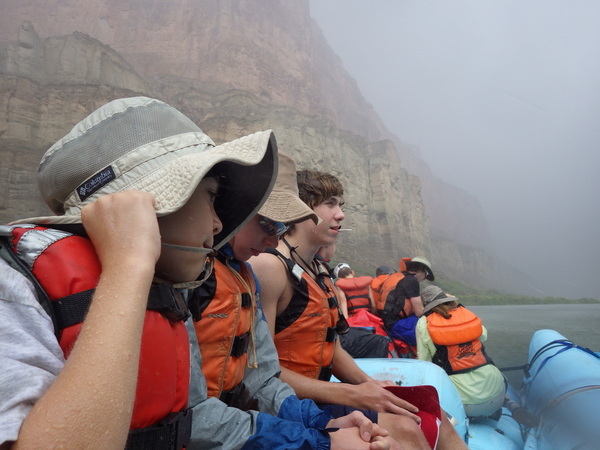 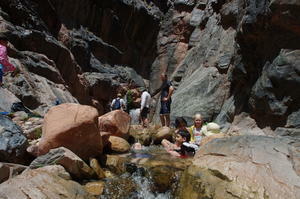 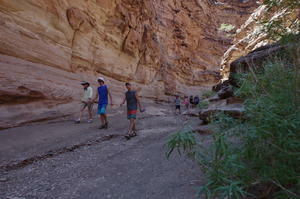 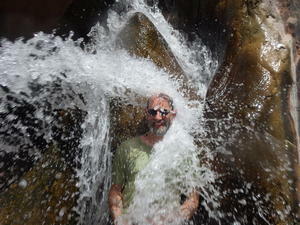 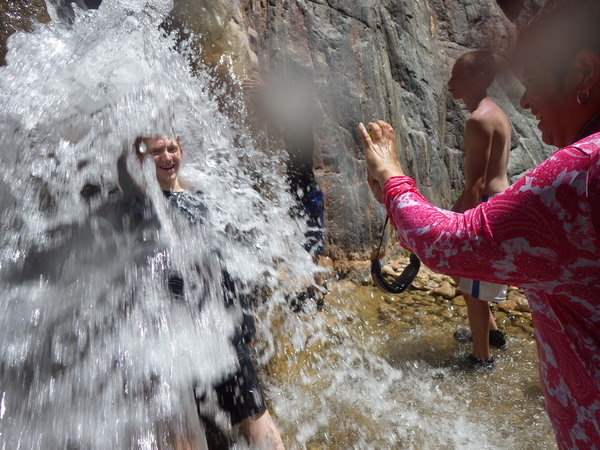 A little more splashing and canyon views after lunch to get to our next spectacular campsite. This campsite came with it's own hike built in. Up to the first clifftop to see more petroglyphs and the foundation of a granery. 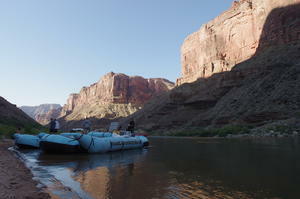 And another beatiful spot for a photo (thanks Ian). We also did the Daves photo here: that's David, David, David and David. 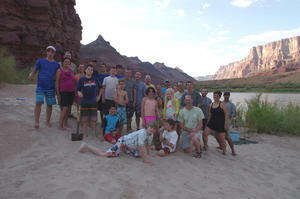 And back at the campsite, we did the full group. The baseball also came out at the campsite. 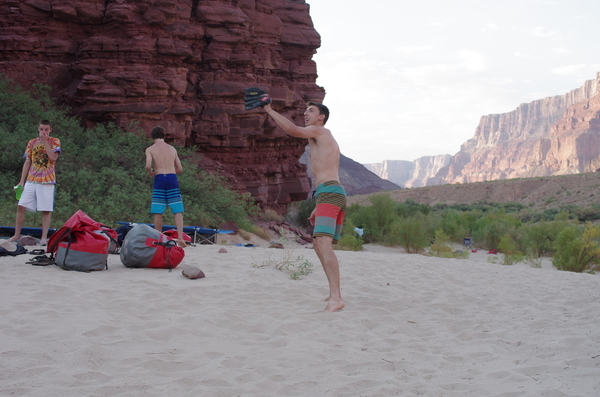 It's a fun little competitive version of catch. 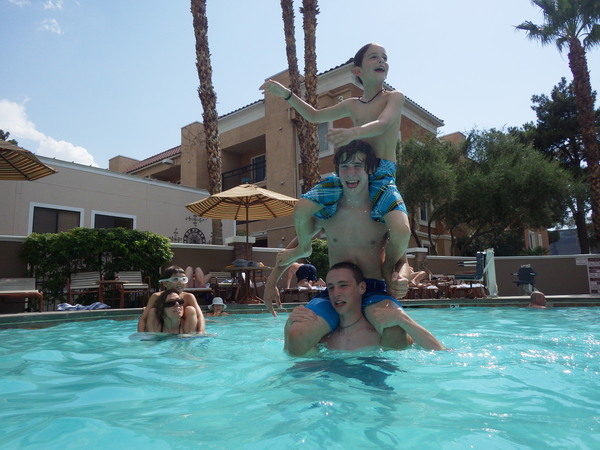 You'll have to ask Ian or David Z. for an explanation. Danny, Kathryn, Ben, Lynn, Cooper (with the shovel), Chet, Ryan, Noah, Ben (kneeling), Sammy (no shirt), John, Jake, David H., Jacob (in front), Mark (in back), Maya, Sarah, Jessica (in back), Dave B (in back), Makayla, Robert (sucking down a root beer), Val, David Z, Ian, David W. Jim and Galinda, and Matt the trip leader. 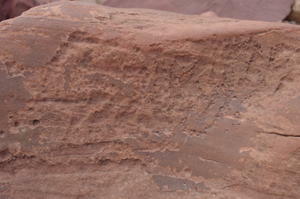 This version (which is not as good), adds Ed on the far left, Easy on the far right and John in the back with his hands in the air. 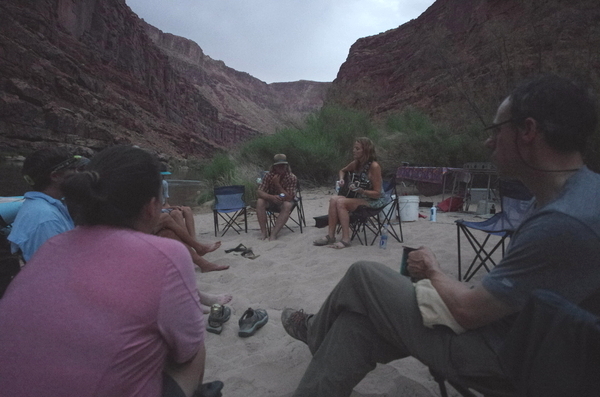 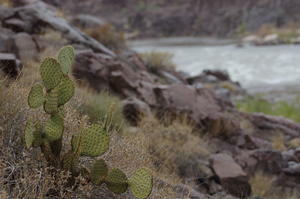 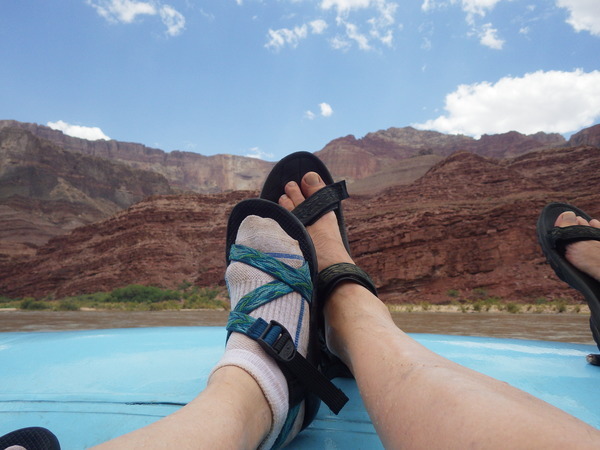 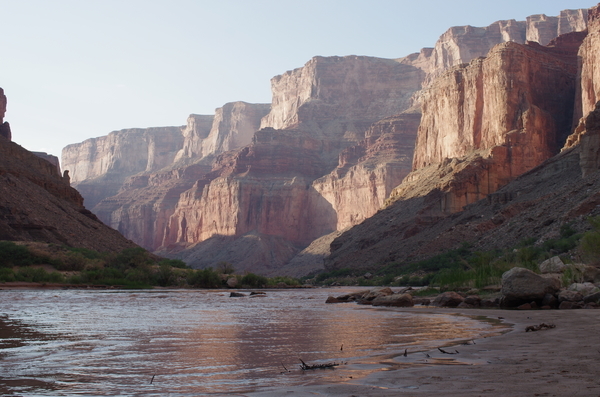 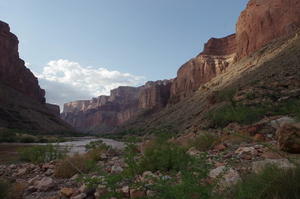 River day four... let's go "That way..."
But first, an interloper in camp: a canyon rattlesnake. 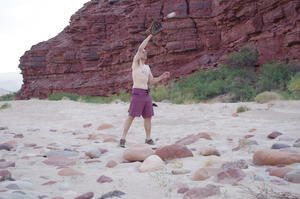 Matt eventually put it in a bucket as it started to warm up and get interested in moving around. He dumped it (gently) out of the bucket once we were all on the rafts and ready to go. 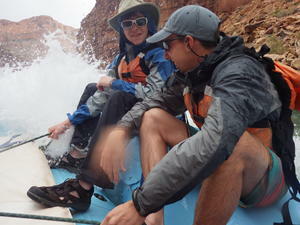 By day four, Robert and Jake knew the routine and were happy to help with raft loading. Before they could help, they had to wake up. 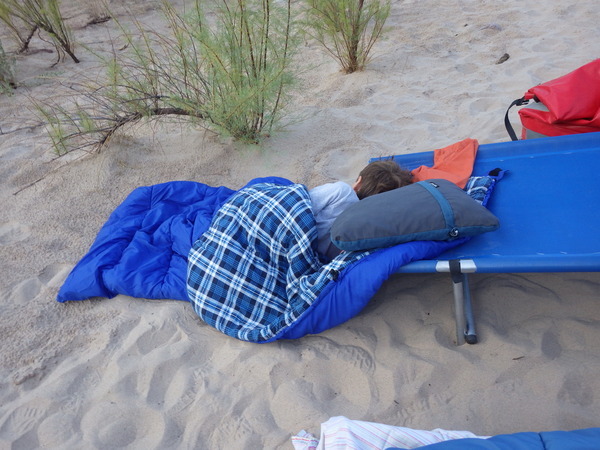 We found Robert with his head on the cot and his body on the sand. In contrast to Sammy, whose body was in the cot but head was trying to get to the sand. That's what comes from camping on a slope. Scale can be hard to comprehend here. 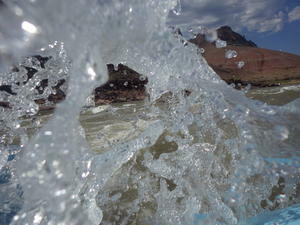 There is a raft in all three photos below; in the middle, it's making the spray off the wave. 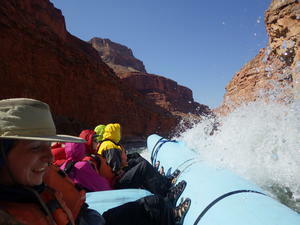 A few more rapids, a few more calm stretchs and we arrived at our next campsite. In retrospect, we named this one the oven, especially for the boys who set up in the cliff bowl. 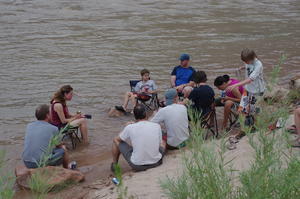 We pulled the chairs down to and into river to get a bit cooler. 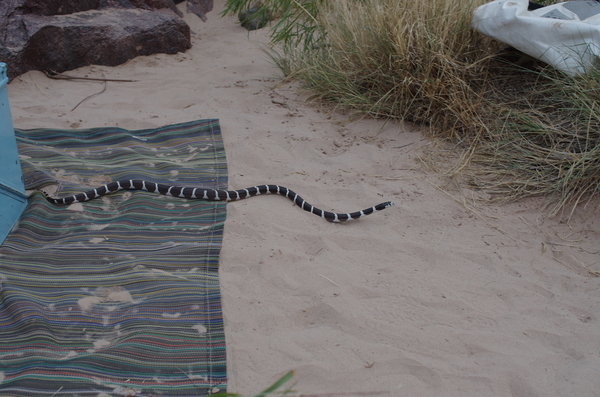 This was our double snake campsite: another rattlesnake (shedding under a rock by the river) and this pretty king snake (apparently they will take on rattlesnakes so we were hoping this guy would do his job for us). This one was just passing through our camp (a couple of times). 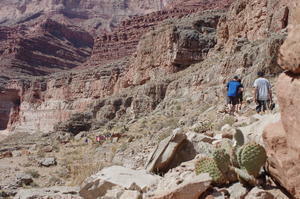 See part two for the second half of the trip.